The BreedingPlum-Crowned Pionus Pionus tumultuosus has a unique blend of qualities which make this species fascinating to aviculturists. Its beauty, quiet and interesting behaviour combined with considerable captive management and breeding challenges have ensured that for those who have been fortunate enough to work with this species in captivity on the few occasions when successful breeding has been achieved, the breeding of few other species could have given greater satisfaction. The Plum-crowned Pionus measures about 29cm (approx. 11½ in) in length. Weights recorded for the adult pair at Loro Parque at the end of the 1996 breeding season were: male 224g and female 265g. The general colour is green which is paler on the underside of the body. The feathers of the sides of the head are red, tipped purple, with white bases to the feathers showing through, particularly below the eyes. The crown of the head is darker red, which becomes purple-red on the neck and breast. The under tail- coverts are bright red with yellowish-green tips. The bill is olive-yellow; the legs and feet are grey. Immature birds vary from the adults in having the nape and hindneck green like the hack, the cheeks and breast are also green. The under tail-coverts of immature birds are also yellowish-green with only slight red markings. Little recent field information is available to assess the size of the wild population although it is known that this species prefers high altitude mountain regions at 2.000m (approx. 6,500ft) and higher in eastern Peru and Bolivia, which is perhaps the main limiting factor to the size of the wild population. The Plum-crowned Pionus has always been extremely rare in aviculture and poor captive breeding results have now brought the Plum-crowned Pionus to the point where it has almost disappeared from aviculture. A single male was present at Loro Parque for many years, until a young female was located in South Africa, bred there by Dr Deon Smith. The pair settled down well together but no signs of breeding were recorded prior to my arrival at Loro Parque in 1994. As with all of the other pairs of Pionus, the pair of Plum-crowned have two feeding periods each day. At 7:00am they are given a main dish of approximately 60g of diced salad which comprises items such as apple, pear. lettuce, tomato, orange, beetroot, alfalfa, red pepper, banana, palm fruit and carrot. A second food dish supplies the birds with approximately 30g of commercial pelleted food (Pretty Bird Hi-protein special) which is available to the birds throughout the day. At 3:00pm the remains of the salad are removed and replaced by a new dish containing approximately 50g of mixed seed and grain such as sunflowers, safflower, corn, millets, oats, niger and hemp, and cooked pulses such as mung beans. black-eyed beans, lentils and chick peas, etc. Drinking water is available to the birds at all times and is from a special filtered supply which passes through a series of chlorination, reverse osmosis filtration and finally ultra-violet light sterilization. In addition the birds arc provided with daily showers in the late morning or early afternoon from a fine mist spray sprinkler system which is included in the design of every exhibition cage in the parque. During the early part of the 1994 breeding season, the pair were transferred to a newly constructed exhibition area for Pionus and had settled down well by the second part of 1994, but without showing any signs of nesting behaviour. No serious attempts were made at breeding by the pair during 1995 or 1996, most probably due to construction work taking place from mid-1995 to early 1996 on a new cinema in the parque very close to the Pionus cages. When this disturbance ceased in spring 1996 the behaviour of the birds improved and indications of breeding were observed. The female spent several weeks during which she frequently entered the nest-box and the nesting medium was chewed into a scrape, but no eggs were laid. In spring 1997 the pair again began to show signs of breeding behaviour, and on February 19th laid their first egg. The clutch eventually consisted of three eggs but after they had been in the nest-box for several days it was evident from nest-box inspections that they were not being incubated properly. I removed the eggs and placed them in an incubator. When first candled they all had large air-cells, but no sign of fertility could be seen. After five days in the incubator all three eggs began to show embryo development but none of the embryos survived past 16 days of incubation, probably due to the early period of poor brooding by the parents. The pair continued to show breeding behaviour and a second clutch of eggs was laid, beginning on April 27th. On this occasion we had the option of a pair of as Foster ParentsMAXIMILANPIONUSMaximilian's PionusMAXIMILANPIONUSMaximilian's PionusMaximilian's Parrots Pionus maximiliani which were incubating nearby and which could be considered as potential foster-parents (see Some Examples of the Use of Foster Parents at Loro Parque). The Plum-crowned Pionus laid four eggs in their second clutch and so two eggs were removed and fostered under the Maximilian's Parrots. The other two eggs remained with the natural parents, together with one of the Maximilian's eggs so that the clutch-size of the Plum-crowned Pionus was not changed too dramatically and numbered three instead of four eggs. 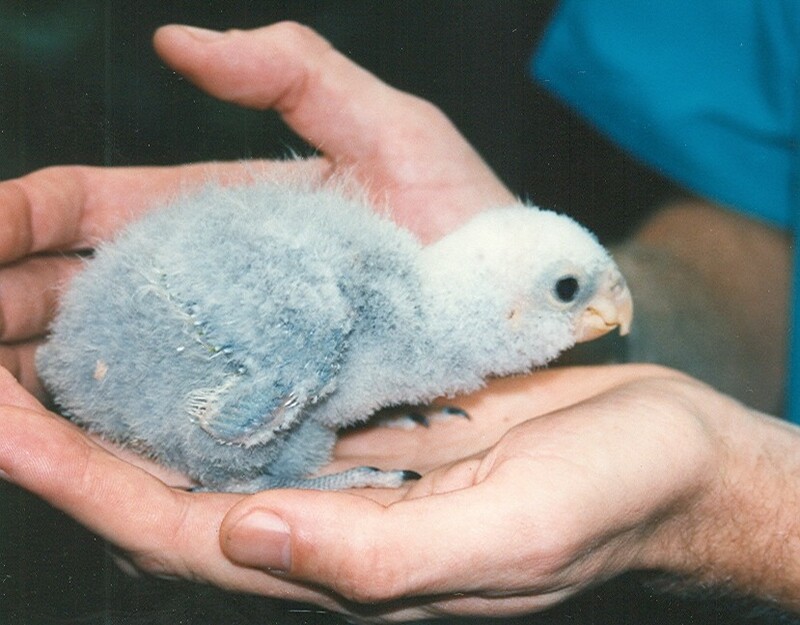 The remaining Maximilian's Parrot eggs were taken for artificial incubation and rearing. The pair of Plum-crowned Pionus failed to hatch their own eggs, but did hatch and rear the single Maximilian's Parrot chick thereby demonstrating good parental ability. Once the Maximilian's Parrot chick was a few days old, the two unsuccessful Plum-crowned Pionus eggs were removed, measured and necropsied. Both showed embryo death at mid-term of incubation. External measurements of the eggs were 38.3mm x 27.4mm and 34.6mm x 27.0mm. Meanwhile the pair of Maximilian's Parrots had managed to hatch both of the Plum-crowned Pionus eggs that they had been given. On discovering that the chicks had hatched our thoughts turned immediately to considering what steps could be taken to reduce the possibility of fungal conditions such as aspergillosis, which have been the most significant problem in the successful breeding of this species in captivity. Prior to the breeding season the nest-box was disinfected and provided with clean wood shavings as a nesting medium, and these were lightly dusted to prevent a parasitic infestation By the time that the chicks hatch the nesting medium has become soiled, not to a degree which would normally cause me concern, but in the case of this species extra caution was deemed prudent. We waited until the fifth day and then the nesting medium was quickly replaced with clean shavings. The chicks when viewed closely are among the most attractive that can be encountered in the Parrot family. The primary natal-down is dense and soft white in colour, similar to that of newly hatched Keas Nestor notabilis and chicks of the black cockatoos of the genus Calyptorhynchus. On June 12th the chicks were handled briefly to ascertain if they were ready for closed leg bands to be fitted, and at this time they were weighed and crop and cloacal swabs were taken as a precaution. The chicks appeared in very good body condition but the cultures from the cloacal swabs showed a significant growth of E. coli (more than is routinely seen from other similar parent reared chicks of this age), and so a three days course of antibiotics was administered without any significant interruption to the chicks' growth rate. Subsequently, the wood shavings were changed regularly until the time of fledging. On July 15th we suffered a great disappointment when we discovered that one of the chicks had died in the nest-box. The necropsy was inconclusive, although a fungal infection was considered the most probable cause. The remaining chick was then removed from the nest-box and transferred to the clinic. Now close to being fully feathered the chick was initially given three feeds a day arid was subject to close observation. The young bird seemed strong and showed no sign of either fungal or bacterial infection, hut it remained very nervous. After two days it was introduced to a young Lilacine Amazon Amazona amazona lilacinaAmazona a. lilacina which, due to a leg fracture just before fledging, had also been brought into the clinic. The Lilacine Amazon was more confident in its behaviour and began feeding from the food dish almost immediately. The Pionus remained more nervous but certainly became more confident in the company of the Amazon and after a week was also starting to eat from the food dish. The chick was eventually eating on its own four weeks after being brought into the clinic. The young bird was now in beautiful condition with a richness in the coloration of the plumage which was even more striking than that of the male parent which I have long considered to be one of the most beautiful birds in the parrot collection at Loro Parque. The above article was written when Roger G. Sweeney was curator of Birds at Loro Parque. He is now curator of the Tracy Aviary.